VATICAN CITY (CNS) — The quest to find life on other planets got a boost when astronomers confirmed the existence of at least seven Earth-sized planets orbiting a red dwarf star just 40 light years away. Three of the planets are located in the so-called “habitable” zone, a kind of “Goldilocks” sweet spot in that their distance from the sun makes them not too hot, not too cold, but just right for having liquid water — an essential ingredient for life. The pope’s own astronomers applauded the new discovery around the dwarf star, TRAPPIST-1, named after one of the many telescopes that detected the planets. The study’s results were published in Nature magazine Feb. 22. “The discovery is important because, to date, it has revealed the highest number of Earth-sized planets revolving around a single parent star,” U.S. Jesuit Father David Brown told Catholic News Service. 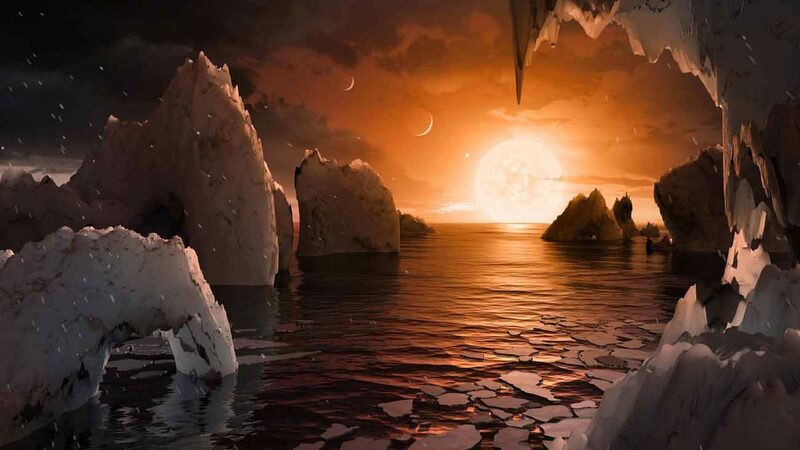 “Depending on different factors, all of the planets could potentially harbor conditions for the possible existence of life on them,” he said in an email response to questions Feb. 24. “It is also significant because it shows the existence of such exoplanets — planets outside of our solar system — around low-mass — smaller than the Sun — cool, red, dim stars, which are the most common types of stars in galaxies and which have long lifetimes,” said the astrophysicist, who studies stellar evolution at the Vatican Observatory. He said scientists and astronomers will now want to use newer and more powerful telescopes to learn more about the TRAPPIST-1 solar system, such as the planets’ atmospheres. “The aim is to look for signs of the presence of chemicals like water, methane, oxygen and others by looking at the spectra of the light observed from those atmospheres, and as well to try to examine other atmospheric properties,” Father Brown said. The name TRAPPIST is an acronym for the “Transiting Planets and Planetesimals Small Telescope,” which is located in Chile, but the name also reflects the exploration project’s Belgian roots by honoring Belgium’s famous Trappist beers, made by Trappist monks. “The use of religious names in space discoveries is not rare,” the astrophysicist priest said, because religious men have been among the many scientists contributing to human knowledge of the world and universe throughout history. For example, he said, several craters on the moon are named after Jesuit priests and brothers and the SECCHI (Sun Earth Connection Coronal and Heliospheric Investigation) instruments being used for solar research are named after Jesuit Father Angelo Secchi, one of the founding fathers of modern astrophysics. “An answer to that question would have a profound impact on humanity in this world as well as confronting us with the question of how we would interact with our cosmic neighbors,” said the Louisiana native. While there is no definitive proof yet that extraterrestrial life exists, “our faith in the fact that life exists is strong enough to make us willing to make an effort in looking for it,” he said in an article in the Vatican newspaper, L’Osservatore Romano, Feb. 24. Brother Consolmagno, a planetary scientist, told the Italian bishops’ news agency, SIR, that when it comes to discoveries about the universe, he always expects them to be surprising. “Every new surprise is a tiny burst of joy before his creative greatness,” he said.